The San Antonio Spurs have rarely been under .500 since Gregg Popovich’s second year as coach in 1997. 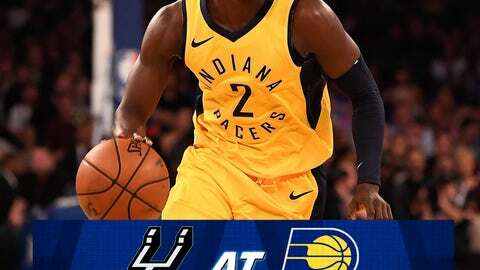 The Spurs (8-9) will play at Indiana (11-7) on Friday night. Both teams are coming off a disappointing loss. The Spurs suffered a 104-103 loss to Memphis on Wednesday night when San Antonio’s Rudy Gay fouled Marc Gasol with 0.7 seconds left. Gasol hit both free throws and on Spurs forward LaMarcus Aldridge‘s potential game-winner, Gasol made contact with Aldridge but no foul was called. Popovich said the Spurs and Grizzlies competed aggressively. “Unfortunately, we got a foul at the end,” Popovich said. Popovich said the goal is always to get better. The Pacers saw a three-game winning streak end with a 127-109 loss at Charlotte. The Hornets sank 18 3-pointers and shot 56.2 percent from the field. McMillan said the Pacers were determined to stop Walker, but also the rest of the Hornets. Pacers guard Cory Joseph agreed. “They were hitting all their shots, open shots, contested shots,” Joseph told The Indianapolis Star. Pacers guard Victor Oladipo sat out for the second consecutive game with a sore right knee. He is listed as questionable for Friday’s game. Indiana is 1-8 over the last two seasons when Oladipo doesn’t play, including 0-7 last season. Pacers forward Domantas Sabonis is listed as questionable with a sprained right ankle. Spurs center Pau Gasol, who has been sidelined since Nov. 4, will miss his ninth consecutive game with left foot soreness. The Pacers were 17-of-32 on 3-pointers to beat the host Spurs 116-96 on Oct. 24. A Pacers victory Friday would give Indiana a sweep of the Spurs for the second straight season. Prior to that, the Pacers hadn’t swept the season series with San Antonio since the 1994-95 season.